Between the challenges of her position as president of the Pennsylvania Antiquarian Society in Philadelphia and of taking her relationship with FBI agent James Morrison to the next level, Nell Pratt has got her hands full. Nevertheless, when a powerful developer approaches the Society to make sure the old dairy farm he wants to level is not hiding any archeological or historical surprises that could derail the project he’s planning, Nell decides to make time to personally accompany him to the proposed site. Sheila Connolly is the New York Times bestselling author and the Anthony and Agatha Award–nominated author of three cozy mystery series. 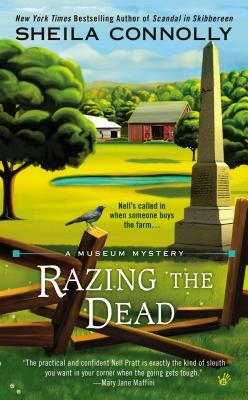 Her bestselling Museum Mysteries are set in Philadelphia, Pennsylvania, and include Razing the Dead, Monument to the Dead, Fire Engine Dead, Let's Play Dead, and Fundraising the Dead, as well as the short story An Open Book. Her New York Times bestselling Orchard Mysteries are set in small town Massachusetts and filled with delicious apple recipes; those titles include Golden Malicious, Sour Apples, Bitter Harvest, A Killer Crop, Red Delicious Death, Rotten to the Core, and One Bad Apple. Scandal in Skibbereen is the second in her Ireland-based County Cork Mysteries, following New York Times bestselling Buried in a Bog. Sheila has taught art history, structured and marketed municipal bonds for major cities, worked as a staff member on two statewide political campaigns, and served as a fundraiser for several nonprofit organizations. She also managed her own consulting company, providing genealogical research services. In addition to genealogy, Sheila loves restoring old houses, visiting cemeteries, and traveling. Now a full-time writer, she thinks writing mysteries is a lot more fun than any of her previous occupations. She is married and has one daughter and two cats.